Early defects when the gene Dorsocross is switched off (Doc RNAi, right) compared to wild type development (WT, left). Click on link to download the movie, movie from this Publication. Late defects when the gene Dorsocross is switched off (Doc RNAi, right) compared to wild type development (WT, left). Click on link to download the movie, movies from this Publication. With this method the phenotype of a gene knockdown can be easily investigated in the living embryo. quantitative PCR (qPCR) is a method to quantify DNA. The exponential increase of specific DNA fragments in PCR is measured in real time using DNA binding dyes or specific hydrolysis probes. The resulting amplification plots can be used to estimate the amount of DNA in the sample at the start of the PCR (Cycle 0) relative to a reference sample. 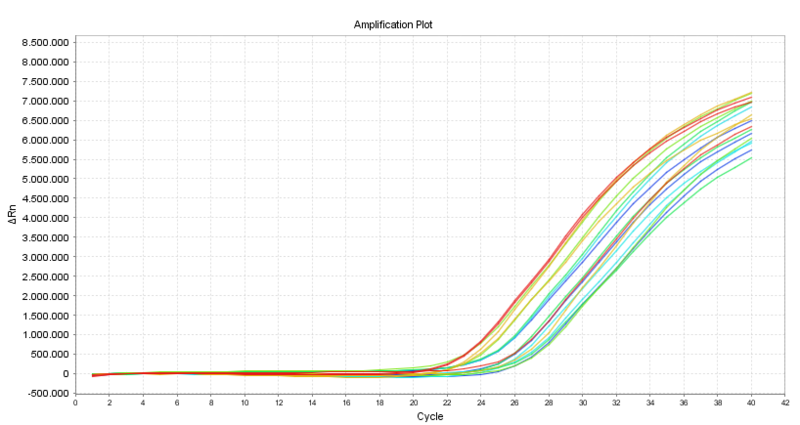 Typical amplification plot showing relative Fluorescence against PCR-cycle number. qPCR has many applications, ranging from diagnosis over analysis of gene expression to detection of GMOs and clinical genotyping. I used qPCR on an Applied Biosystems 7500 fast cycler to investigate expression levels of different genes after the knockdown of my gene of interest. Therefore RNA is extracted from corresponding knockdown and wild type embryos and reverse transcripted into cDNA. 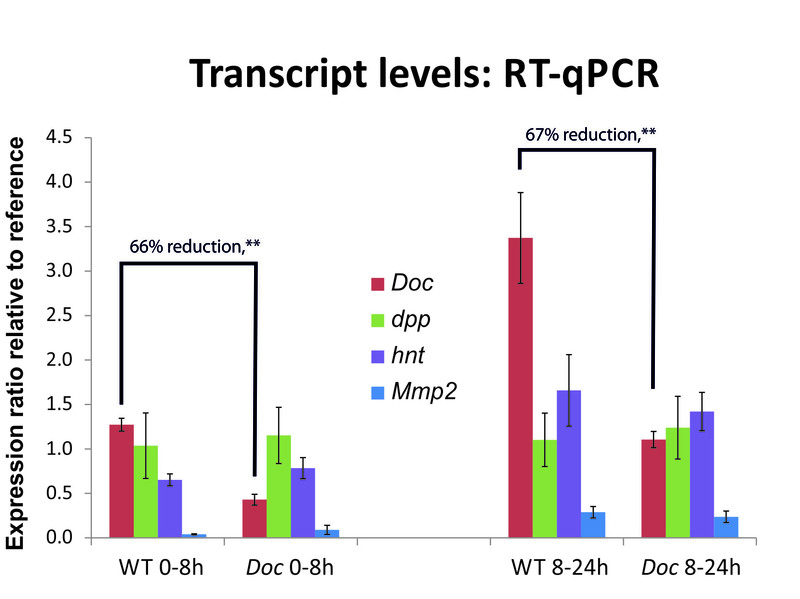 This serves as a template for qPCR (then called RT-qPCR for reverse transcribed quantitative PCR ) with different candidate genes suspected to be differentially expressed between wild type and knockdown. Gene expression of four genes after knockdown of the gene Dorsocross at two different developmental stages. While Dorsocross itself is highly down regulated after knockdown, the other genes do not show a significant change in gene expression, graph from this Publication. In this way we can disentangle regulatory relations between these genes and the gene that was knocked down. 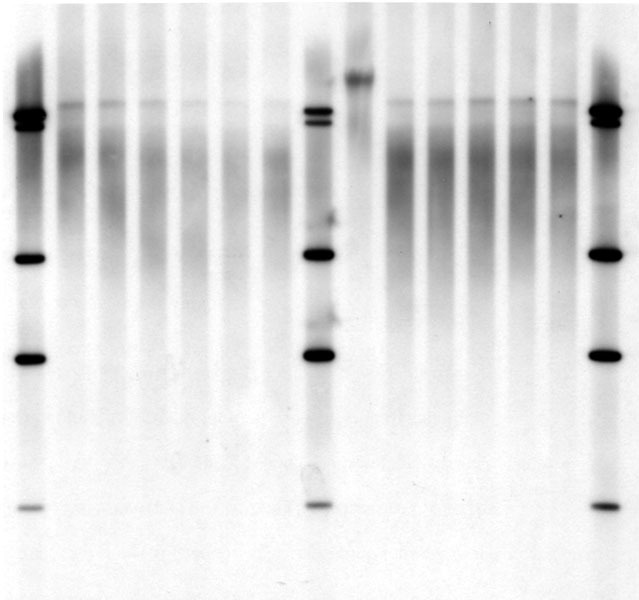 Sothern blot is one of the oldest methods for visualization of specific DNA sequences and still one of the standard methods to measure telomere length. Therefore, genomic DNA is cut by restriction enzymes (unfortunately often different combination in different labs/publications) and the resulting DNA fragments are separated by gel electrophoresis. The separated Fragments are transferred to a membrane and then hybridized to a telomere-probe. Now all fragments containing telomeric sequences are labeled by the probe and can be visualized by Antibodies and/or conjugated enzymes producing light or a colored precipitation. Typically you get a smear of telomeric signal representing all telomeres of the sample. Using the molecular weight standard we can now estimate how large the fragments are and thereby calculate the mean telomere length of the sample.